Ashley Vasquez had six catches for 142 yards and three TDs to lead the Bengals, and teammate Alicia Kestner had seven catches for 73 yards and a touchdown. The game was tied at 20 at the half. Clark 24, Desert Oasis 20 — At Desert Oasis, Valeria Morquecho scored on the final play of the game to give the Chargers the win over the Diamondbacks. Desert Oasis had taken a 20-18 lead with 1:40 to play. Jagayra Gomes passed for 141 yards and two TDS and rushed for 95 yards to lead Clark. Makayla Richard passed for 249 yards and three touchdowns for the Diamondbacks. Ruby Martinez had five catches for 135 yards and a touchdown for Desert Oasis. Silverado 31, Durango 19 — At Silverado, Kennedy Power rushed for 102 yards and a touchdown and intercepted a pass to lead the Skyhawks over the Trailblazers. Katie Mulligan completed 15 of 21 passes for 196 yards and four scores for Silverado. Brielen Aquino caught nine passes for 95 yards and two TDs, and Kathleen Fonua had two catches for 76 yards and two scores for the Skyhawks. Tatiana Baes had 122 rushing yards and a touchdown run for Durango, and teammate Gabriela Gorchado had eight catches for 154 yards and a score. Cimarron-Memorial 21, Centennial 6 — At Centennial, Makenzie Clark had eight tackles, two sacks and an interception as the Spartans beat the Bulldogs. Mya’Liah Bethea had 13 catches for 132 yards, and Dina Lee had four catches for 70 yards and two scores for Cimarron. Natasha Obradovic added six catches for 75 yards and a TD for the Spartans, and quarterback Tiarra Del Rosario completed 26 of 35 passes for 300 yards and three scores. Palo Verde 14, Shadow Ridge 7 — At Palo Verde, Mya Boykin provided a rushing touchdown and a receiving TD to help power the Panthers past the Mustangs. Samantha Guerra ran for 137 yards and a touchdown on 16 carries for Shadow Ridge. She also had 11 tackles. Chaparral 38, Valley 26 — At Valley, I’asia Mack threw three touchdown passes as the Cowboys rallied to down the Vikings. Bree’jahn Banks scored on a 40-yard run and caught five passes for 70 yards and a touchdown for the Cowboys, who trailed 20-18 at halftime. Amerie Baker ran for 90 yards and a touchdown on 12 carries, and Vanessa Sanchez ran for 40 yards and a touchdown on six carries for Chaparral. A.J. Andranne and Beverly Amayo each caught touchdown a touchdown pass for the Cowboys. 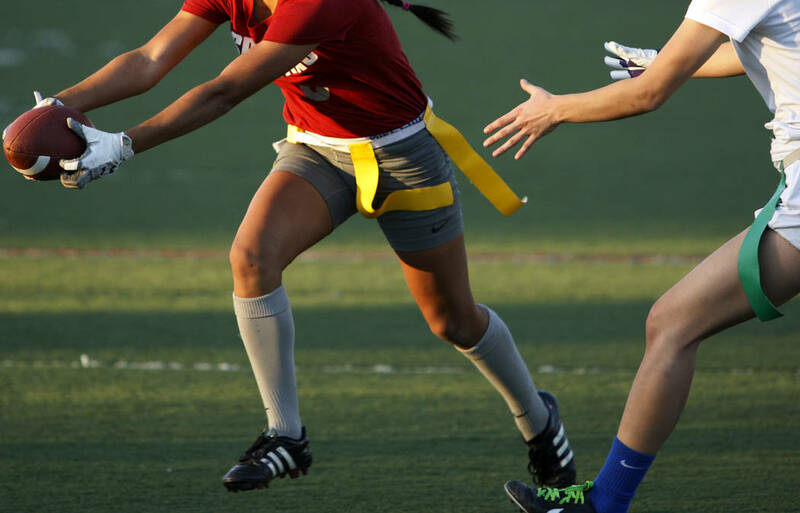 Frida Ochoa-Uribe ran for two scores, and Heather Robinson caught two TD passes for the Vikings. Virgin Valley 34, Sunrise Mountain 12 — At Sunrise Mountain, Shaylee Feltner rushed for 112 yards and two touchdowns on 12 carries to lead the Bulldogs past the Miners. Julia Ramirez rushed for 120 yards on 19 carries, and Ally Wright had a rushing touchdown and a passing touchdown for Virgin Valley. Wright completed 9 of 12 passes for 92 yards, including an 11-yard scoring pass to Taylor Marshall. Ruth Cano supplied a 60-yard TD catch, and teammate Hope Humes had a rushing score to lead Sunrise Mountain. Del Sol 58, Moapa Valley 6 — At Overton, Janeth Varela caught two touchdown passes and returned an interception for a touchdown as the Dragons rolled by the Pirates. Varela had three catches for 45 yards and picked off two passes for Del Sol. Stephanie Tewart completed 10 of 14 passes for 177 yards and four TDS, and Arlene Salano and KatieRae Patriquin each had a TD pass for the Dragons. Mariah Barajas caught four passes for 125 yards and two TDs, and Kaitlin Harrah and Shelby Martin each added a TD catch for Del Sol. Arnell Jones had four carries for 94 yards and two TDs for the Dragons, who got three sacks from Kassandra Medina-Bernal. Sierra Vista 39, Spring Valley 18 — At Sierra Vista, Jamie Kaalua-Sunia threw for 205 yards and three touchdowns and ran for a score as the Mountain Lions downed the Grizzlies. Western 20, Mojave 12 — At Mojave, the Warriors knocked off the Rattlers.